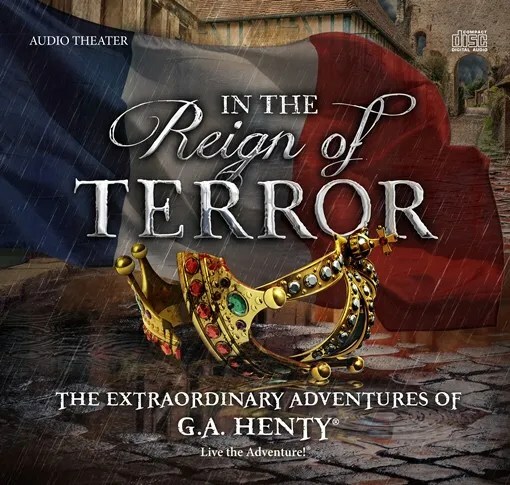 In The Reign of Terror From Heirloom Audio Productions: My Review | My Journeys Through Life . . . Herding Cats In New Mexico! Our family has been very blessed to have had the opportunity of reviewing each new release from Heirloom Audio Productions that has come out during our time with the Homeschool Review Crew. This time around, we have been given the wonderful opportunity to listen to and review Heirloom Audio’s newest production, In the Reign of Terror, which takes place during the French Revolution. Prior to this, We have, during my time on the Homeschool Review Crew been very fortunate to review the following: The Dragon and The Raven, With Lee In Virginia, In Freedom’s Cause: The Real Story of Wallace and Bruce, Under Drake’s Flag, Beric the Briton, and The Cat of Bubastes. I think that one of the things my family and I enjoy most about the Heirloom Audio Productions is that they are not simply audio books, they are actual theater! It is as if we are listening to a movie, and we very quickly become enthralled with what is happening. As I had said in one of my earlier reviews, I can remember my dad telling me about when he was a child, that they listened to exciting programs on the radio.They didn’t have television, of course. He said even my grandma used to listen to her “stories” on the radio, way before they became a staple on network television, lol! In the Reign of Terror is, as I said, much like a film (to us) with everything except for the visual part. The voice acting is as wonderful as it has been in each and every other Heirloom Audio Production that has been released so far, and the sound effects are wonderful. But as usual, I am going to be the most effusive about the musical scoring by John Campbell, who is an Emmy Award Winning Composer. Not only do I really love great music, but when it comes to scoring, that can make or break a production as far as I am concerned! As has been true in past productions, we begin with “Mr. George” about the “similarities” between the French Revolution and the American Revolution. This time it is an English boy named Harry. Mr. George is of course patterned on G. A. Henty, and he tells the boy the story of the French Revolution from the viewpoint of a British boy named Harry who is sent to France to teach the English language to the children of a nobleman. Harry is age 15, so this must have been an exciting sounding idea! But then, the French Revolution begins! We learn about differences between the French Revolution and the American Revolution (or War for Independence.) In American, the people simply wanted freedom, and resisted the King and England as peacefully as they could for as long as they could, before having to fight for a hard-won independence. In France, it was not about freedom or equality. it was a mob mentality, where those not of noble blood wanted a complete reversal of roles. It got to the point that people were arrested and killed simply from being a noble born person. I myself learned more than I ever have about the French Revolution. The family (and Harry) running from danger are believers, as were many others in France. I really enjoyed once again hearing the familiar voices of Brian Blessed and John Rhys-Davies, along with other very talented actors seen in the image below. It is designed for parents who want help talking their younger children through the story and its lessons. It can also serve as series of written assignments for older students. The sets of questions begin and end as the story takes new turns, and each may cover from four to eight minutes of the audio drama. Each set of questions has three parts, Listening Well, Thinking Further, and Defining Words. The Listening Well questions ask your child what he has heard or what he remembers. You’ll find that there are easy and not so easy questions, but they can all be answered by listening again. mentioned in the story, to draw conclusions from the characters’ actions, or to speculate about the intentions, mindset, and character of Harry and his friends and enemies. This is a great opportunity to go off on “rabbit trails” inspired by what comes out of this thinking and discussing! The Defining Words section is exactly that. It will give your child the opportunity to learn new words by looking them up, thus enhancing their vocabulary through this production. In the Live The Adventure Club, you can communicate with others about the various Heirloom Audio Productions, you can listen to your CD online (and stop it after each section so as to go over the study guide for that portion), and purchase other productions. There are also tons of other fun and educational things provided! I recommend that you check it out, it’s really terrific!